Ah the Black Dog Tavern, a Martha’s Vineyard dining out classic, a beacon in Vineyard Haven’s port. Lots of us know and love it for breakfast, I myself am a professed Back to the Capital fan, but when is the last time you had dinner at this iconic Island restaurant? Things have changed at the Black Dog Tavern. The new chef, Darryl Black, a graduate of the culinary program at Johnson & Wales is making waves in the kitchen. By making waves, I mean really serving up good tavern food. He has an attention to detail and execution, and flavors that have gotten people talking again about this popular Martha’s Vineyard Restaurant. Not only are people saying how good the food is, but people are big fans of the offseason, Frugal Foodie special nights. Wednesday is 1/2 Price Burger Night where guests can enjoy half price burgers and not just the BD Classic but all burgers including beef, chicken, lamb, and veggie. On Thursday, it is Island and Italian Night. It pays to be an Islander this night because guests with a valid Island ID get 15% off their food purchase. And, you get to check out Chef Black’s new weekly Italian specials! Fridays at the Black Dog Tavern are fun! Friday is Lobster Night! Lobster lovers head on in and order the lobster, served with potatoes or corn, your choice of steamed for ONLY $20 or stuffed for $28. Hello FRUGAL FOODIE ALERT! In classic tavern fashion, Black Dog has Saturday Prime Rib Night. We know that Islanders love this night! Diners can get the BD prime rib with baked potato & asparagus for $20.00 or make it surf & turf with a lobster tail for $30! Once again – FRUGAL FOODIE ALERT! I myself love a good reason to have pasta for dinner, and not eating my kiddos Mac & Cheese leftovers, but a real pasta dish. So, I gathered my family and headed over to the Tavern to try Italian night. One thing that I love about the Black Dog Tavern, that I hope never changes, is the view. Watching the ferries come and go does not get old. Also, the early evening light on the water this time of year is just magical. Add good food, a glass of wine, and good company and you have a perfect “little Friday.” Little Friday is what I call Thursday to make the day feel a more celebratory. Since I was indulging, we started with the Deep Fried Oysters for an appetizer. How could I not! The menu says “right out of the pond,” lightly breaded & fried. I adore fried oysters and these were really delicious. If you order these, you might notice the Black Dog Burgee next to them, see below. It turns out that the menu items marked with this are “our hand-picked Captain’s Table selections from “The Black Dog Summer on the Vineyard” & “The Black Dog 40th Anniversary” cookbooks. Some of these iconic dishes go back to our earliest days.” These items are beloved classics! I have to also mention the loaf of warm bread that is for the table to share. Fresh baked and warm enough to melt butter – my kids couldn’t get enough of it. The apps were so good, that come dinner, my husband and I ended up sharing. We had to have something from Chef’s weekly Italian menu. Raviolis are always a favorite for us both. So when we saw the Pasta of the Day was Ricotta cheese raviolis with a lemon tarragon cream sauce, the choice was easy. The portion was generous and the dish was delicious. The tart lemon, the bright tarragon and the creamy sauce were simply perfect on our heart shaped raviolis! I don’t think they are supposed to be hearts, but look how much they resemble hearts. Anyhow, this dish sure made my heart happy, well, maybe more stomach happy. Your wallet is happy too because you save 15% on your meal! I bet if I had not shared my raviolis, I would have had plenty to enjoy for lunch the next day. An added bonus – the kids were thrilled with dinner too. The Black Dog Tavern kid’s menu is great. Plenty of options and only $8 per meal, including drink. I had no idea. My kids loved it, and so now the Tavern is on our kid friendly list! Dinner was really nice. It had been years since I had been to the Black Dog Tavern after 11:00 a.m, but with good food and FRUGAL FOODIE deals, I can see us going back soon. When I spoke with manager Chris LaPointe, he told me that the Black Dog Tavern plans to run these specials through May! Be sure to keep an eye for the Tavern’s Wine Dinners too. The next one is planned for April 11th, details to follow. The Tavern has an excellent selection of wine, beer, and a list of signature cocktails. So glad Vineyard Haven has beverage options now. Also, don’t forget to check out the newly renovated Black Dog Water Bakery opening the first week of April. The Dockside Black Dog opens in May. You can learn more about the Black Dog Tavern on Facebook. Don’t forget to like Point B Realty on Facebook and follow us on Twitter, LinkedIn, Pinterest, Youtube and Instagram. 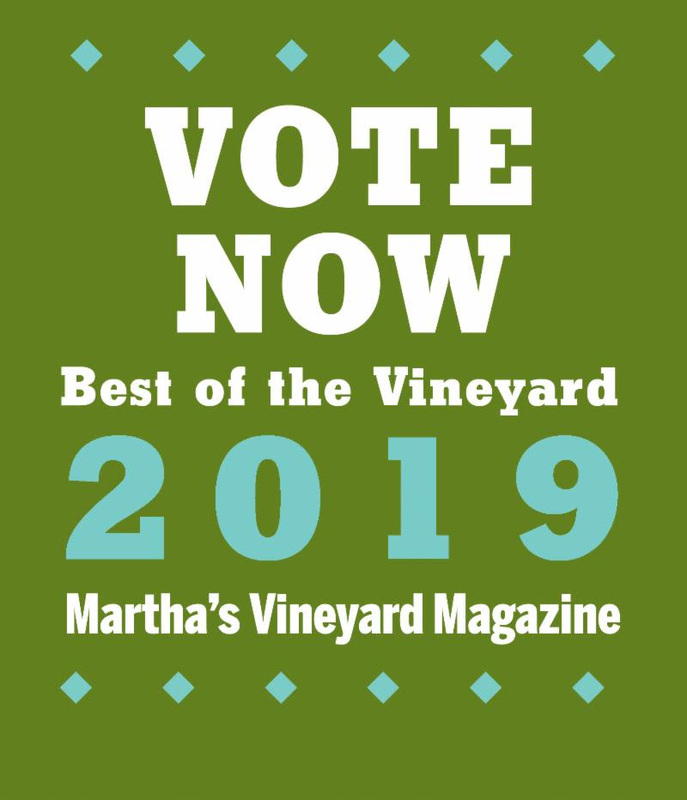 Please consider voting for Point B Realty for Best Real Estate for this year’s Best of the Vineyard (we have been honored to hold the title the last 5 years). Click here to vote. Voting ends April 6th.